If you don’t want to make the chilli onions, add 2 chopped, deseeded chillies to the soup, or some harissa to taste, instead. Heat the oil in a heavy pan and sauté the onion and celery until soft but not coloured. Add the garlic and spices and cook for 1 minute, then add the remaining soup ingredients apart from the coriander. Bring to the boil, reduce to a simmer and cook for 30 minutes, or until the lentils become a purée. Season and stir in the chopped coriander. To make the chilli-fried onions, quickly fry the sliced onions in very hot olive oil until golden brown with crispy bits. Add the cinnamon, sugar and chilli. Stir and, once the sugar has melted, add the lemon juice and season. 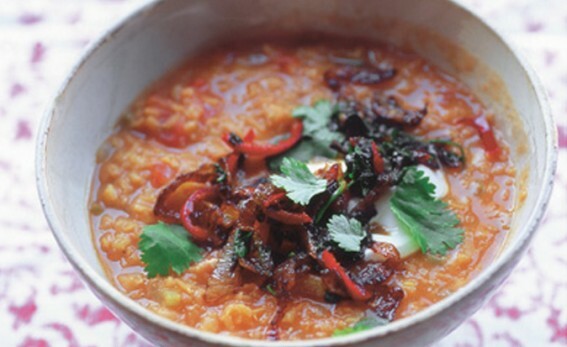 Serve the soup in hot bowls with a dollop of yogurt and the chilli-fried onions. Garnish with coriander leaves. 1.5 litres (generous 2 ½ pints) stock made from a ham bone (make sure it isn’t too salty; dilute with water if it is). Sauté flakes of ham or chunks of bacon in butter, adding 2 tsp caraway seeds. Scatter on top of the soup, with a swirl of cream, if you like. 3 tomatoes, chopped, 2 thyme sprigs and 1 litre (1 ¾ pints) water or chicken stock. Bring to the boil, reduce the heat, cover and cook until tender – about 45 minutes – topping up if it’s too thick. Season well. Shred 250g (9oz) spinach and add to the soup to wilt. Add the juice of ½ lemon and stir in 4 tbsp extra virgin olive oil.